Aadhar Card Online Registration process is not yet started by Indian Government but still, people are still searching for Aadhar Card Online Registration or Aadhar Card Online procedure. one of the biggest reason why Aadhar card online registration is is not available because Aadhar card registration requires fingerprint scan and retina scan which is not done through online. Please note that you are NOT allowed to apply for Aadhaar Card online registration because you need proper equipment to enroll Aadhaar Card. Aadhaar card center is generally used for Aadhar card registration. You can take Appointment for Aadhaar card Enrollment centers using Aadhar card official website. If you wish to enroll yourself for Aadhaar card you must be physically available at the time of enrolment at Aadhaar card center. 5. in this step you will get acknowledgment slip which contains your Enrolment ID. Aadhaar Card online registration for Appointment is started on some Aadhar center and it’s not mandatory to take Appointment for Aadhar card enrolment. if you want to check whether your Aadhar card enrolment center provides online appointment facilities than you can check Your nearby enrolment center from here. Note: You can also visit nearby Aadhaar card enrolment center without an appointment. Aadhaar Enrolment process is free and voluntary. This form is completely free. you can also use this form for correction purpose.You can download Aadhar card Application form from this link. ADDRESS: Write complete address which shows in your original Proof of Address (POA) document. RELATIONSHIP: In case of children is below 5 years than it is mandatory to provide father/mother/guardian details with their Aadhaar or EID number. DOCUMENTS: Write the name of Documents for PoI (Proof of Identity)and PoA(Proof of Address). if any person doesn’t have individual proof of identity than he/she can apply for Aadhar card with the head of the family document. 1. Firstly, you need to visit Aadhaar card enrolment center with your latest photo along with address and Identity proof . 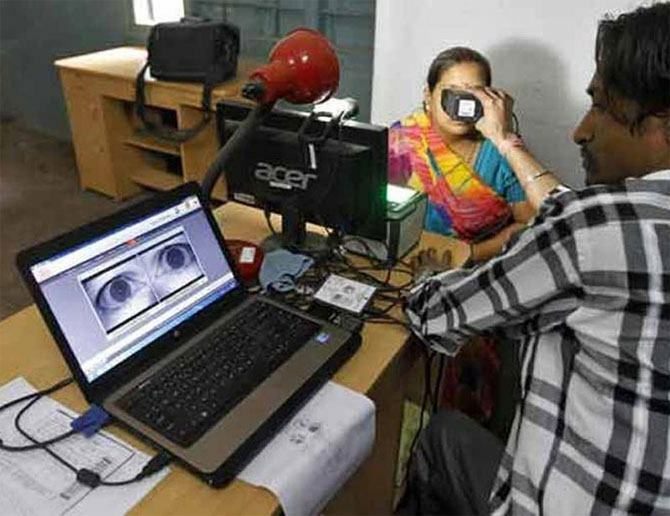 once your number for Aadhar card process you can need to tell your personal detail and soon they will take your iris scan and fingerprints. once everything is complete you need to check all detail so that everything will be correct and you don’t need to edit detail later. 2. Once, the process is done you will receive acknowledgment slip with the enrollment number mention in it. 3. you need to place this acknowledgment slip at the safe place because it will help you to download Aadhar card through online if original Aadhar card is not delivered to your address. 4. The waiting time for Aadhaar is 60-90 days but it may take more time depending on your location and city. aadhaarcardinfo.com is not associated with Unique Identification Authority of India (UIDAI). Our main aim to help every person who needs any kind of help related to Aadhar card.